We have all walked past a rough sleeper on the street. Sometimes we give it a second thought. Sometimes we stop and chat, maybe even try to help. But mostly we walk on by. Most of us are fortunate enough to have never been there and while we sympathise, we often try and forget it and move on with our busy lives. Rushing to get somewhere; an appointment or some such. We often don’t see the person beyond the sleeping bag. Sometimes it is very hard to imagine how someone got there. The government dehumanise rough sleepers. They advise us not to feed them as though they are pigeons in Trafalgar Square. They put spikes on floors to stop them being able to get some shelter in a shop doorway. Again treated like pests. So it’s no wonder that we walk on by. Sometimes it is a taboo subject. But for me it is different. I happen to know a rough sleeper very personally. You might want to ask me a few questions. Does anyone help him? Is he loved? Do you help him? The answer is yes. To all of the above. But our help is not enough and the ‘why’ and the ‘how’ he gets into this position is what is complex. My uncle has undiagnosed mental health conditions. He is an addict. Self medicating I guess. He has never had the support he needed from the professionals. And this is the product of years of neglect. Born in the 60s to parents with severe mental health issues that lost everything down to gambling, my uncle was not diagnosed with anything himself or supported. Instead when the family broke down, my grandmother had a mental breakdown and no one was there to help. The authorities left my grandmother to it and just took my uncle away into care when he was 7. And that was the start of it. In and out of care. In and out of trouble. While he was in the place that was supposed to care for him, he was abused. He went in as a child with problems and came out disturbed with even bigger problems. No one knew what happened at the time. This is only a recent revelation. So he continued. In and out of trouble causing merry hell for the family. As he got to adulthood he started to ‘self medicate’ and slowly but surely became an addict. Which led to petty crime, prison. And eventually being institutionalised . On paper yes. But what no one else saw was the snippets of the man he could have been if the support had been there during his childhood. Detained at Her Majesty’s pleasure, he had structure, routines and he flourished. He took courses and passed them all. He read and learned and became a talented writer. He did endless courses and took all of the opportunities he could. He grabbed them with both hands.So when he went back into the outside world he started his own business, he even wrote for a national newspaper as a regular columnist. He became a published author. Some semblance of a normal life was finally coming his way. He was capable and intelligent and we could see the person he could become if he’d been given more support as a youngster. But things happened and again the support fell away. Without the guidance of a probation officer, without the structure, his mental health problems that simmered under the surface reared their ugly, scathing, self destructing head again. Addiction came back with a vengeance and along came some new ones too. So we saw him slip back. He lost everything and again he went on the slippery slope into the abyss of addiction and self destruct. So, we try to help as a family, but its not possible to keep an eye on him 24/7. The downward spiral was and is fast and relentless;he loses touch of where he is and he ends up on the street. He loses contact with any kind of support network and before you know it he is sleeping rough. We can’t track him. We don’t know where he is. We’ve had phone calls in the past from wonderful passer bys that have tried to help him. In his moments of lucidity he remembers a number of a random relative and some very nice person decides to help him and calls. We then hear he’s been in various places begging as he has lost everything. So we get there and we have to try and get him some help. He’s unwell and doesn’t know where he is. The police come and tell us not to bother with A and E as they are overcrowded but that they will try to help him. Do you notice that even though I’m describing events in the past that I am using present tense? Why you might ask? Because this is a recurring event. This happened last month but it could happen tomorrow, next week, next month. We never know what will happen next. This is the pattern that happens over and over again. Services that are cut to shreds still try their best to help him. There are genuinely good mental health staff, hospital staff, police officers and key workers out there. The services need to be joined up. They need more funding to give him the intensive therapy and support for his mental health needs as this is the root to all of his problems, I believe. But all that happens is the problem is treated that day. Acute support is given while he is physically unwell. But there is not enough in place to prevent this from happening again. So I sit here and wonder what people must think when they walk past him. When he ends up on the street, bounding in and out of shops, trying to get someone to help him. They will never see the man he can be. The man he has been, the man he could have been. Every person has a story, but homeless people are nothing more than pests to the Tories. If we followed the advice that they give us, which is to ignore a homeless person, don’t give them money or food; if every passer by that has helped my uncle thus far listened to this advice that this ‘government’ dish out my uncle would be dead by now. Perhaps that’s what they want. By treating homeless people like pests perhaps they think they will just die off. But instead there are good people out there, people try to help. And for now he and we are riding our luck. That might just change one day. And we dread phone calls sometimes. What will happen next we just don’t know. So I want to say to the people that help, the doctors, the nurses, the passers by, the staff in Pret that give out food, the key workers: Thank You!!! Don’t ever change and maybe one day if we fight hard enough we will have a government that cares too so that real change can happen and people living in the streets being dehumanised by a callous government will be a thing of the past. At this time of year Christians everywhere are reminded that Mary and Joseph found themselves homeless, in Bethlehem, through no fault of their own, but because a physically distant government passed a law to determine how much tax they could collect, in order to keep their privileged citizens in the luxury that they had become accustomed to. Two thousand and seventeen years later, in English towns and cities, you don’t need to walk far to be reminded that, just like Mary and Joseph, there are now many people who find themselves homeless through no fault of their own, because an emotionally distant government passes laws to determine how much tax they could collect in order to keep their privileged citizens in the luxury they have become accustomed to. The idea of taxes is a redistribution of wealth. That redistribution of wealth should be for the benefit of the many wealth producers and not solely for the benefit of the privileged few. I think that a good Christmas present for the homeless would be for the government to put as much effort into their house building policies as they put into their rhetoric about how much they have done, whilst failing to mention how much they have not done that they promised to do. There are currently 4,000 people sleeping rough and over 300,000 people classed as homeless in England, according to the charity Shelter. The figure for the rough sleepers has increased by 134% since the Tories came to power in 2010. Isn’t it time Theresa May and her government owned up to this figure instead of trying to lie about it? Nick Clegg has criticised Corbyn and Labour for “Demonising Austerity” . This will no doubt anger many of us but worryingly it will probably fuel the fire of those that support austerity measures. He has personified austerity. As if austerity is a defenceless being that has feelings. 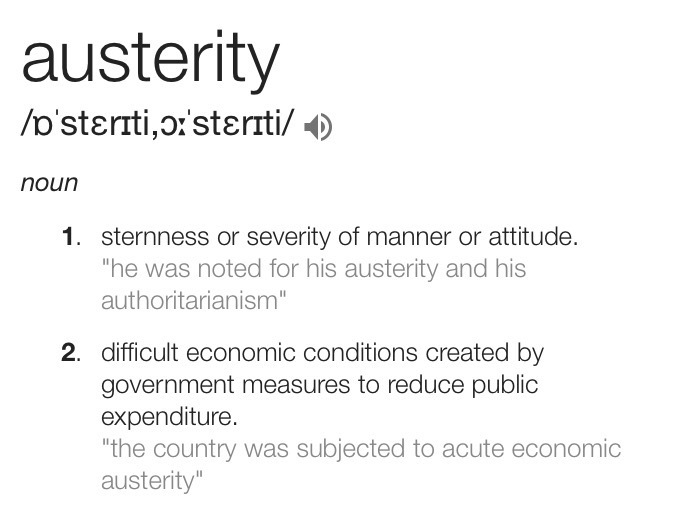 So let us take a look at the meaning of the word austerity. The truth is that austerity has been falsely used. True austerity would mean cut backs in all government spending including MPs salaries but that hasn’t happened has it? The average basic income for an MP increased from £67,000 a year in 2015 (the year they won the election and got into power without the Lib Dems) has rose to £74,000. A whopping 10% !! Hardly ‘tightening our belts’. Well perhaps they can console themselves that they solved the deficit problem, which surely was the reasons they introduced austerity in the first place? But that hasn’t happened either. 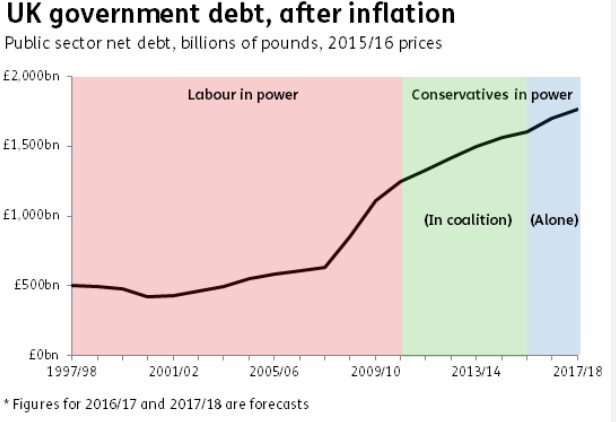 In fact the deficit has increased by 53% (and that is taking into account inflation, otherwise the figure would be much higher). If you can call a 134% increase in homelessness, a rise in the deficit, a pay cap on public sector workers so severe that now 17% of nurses now have to rely on foodbanks an ‘achievement’ then yes it has achieved something. The biggest ‘badge of honour’ that austerity has achieved is the UN finding that the Human Rights of disabled people has been violated by austerity. That is surely something to write home about? If Nick Clegg would like to point out exactly what positive outcomes austerity has achieved, then I will gladly listen to him. Because I don’t understand how can you ‘demonise’ a severe economic policy that has left millions in poverty. What about the feelings of families that have to choose between eating and heating? Do their feelings not matter? Many of those in favour of austerity may cry well how do we deal with the economic problem that we have following the Global Crash of 2008? Perhaps we need to think outside of the box that is Neoliberalism, we have afterall been in this situation before. The Great Depression of 1931 was followed by austerity and a World War that plunged many of the poor into even worse conditions than they were already living in. Similarly, the Global Crash of 2008 and subsequent recession led to the introduction of austerity measures in 2010, and an increase in poverty. Has no one learned yet that tightening our belts after an economic crisis does not work? On the back of the austerity that followed the Depression, Labour Party created the Beveridge Report of 1942, which set out a grand vision of public spending much like the Labour Manifesto of 2017 did. It provided an alternative to austerity and eventually it was accepted and proved very popular. It led to a landslide victory for Labour and the creation of NHS and the Welfare State. After years of austerity and changed the social and economic landscape of the UK for the better and it was just what everyone needed. So when will we learn from previous mistakes and eventual victories? The Crash could have been avoided. Remember, it was caused by the over inflation and free market economics, much like 1931. Keynesian economics would have controlled the over inflation that preceded the 2008 crash and would have opposed austerity measures that followed. Keynesianism is an economic theory that works on the belief that economic demand determines economic output, in other words the more the public are willing and able to spend, the better the economy will perform. And this means investing more into public spending, not less . If the public have more money to spend the economy recovers quickly. If the public are skint and poor, how on earth can they spend anything? It’s quite logical really! Today we see that austerity has not reduced the debt but that the government are quite happy to spend generously when it suits them with the £1 billion DUP deal, so how long can we live under a false austerity? The Tories voted against the public sector pay cap only a fortnight ago, flying in the face of hopes of an end to austerity. The optimist in me however, would like to think that we are on the brink of a radical change for the better and that it is only matter of time before we have a government that rejected austerity. For now though if Nick Clegg wants to defend and personify austerity then we should treat austerity as a person. And in that case (Mr or Mrs) Austerity should be punished by the UN for its’ Human Right Violations and stand trial for fraud. It has been lying to us all from that start.